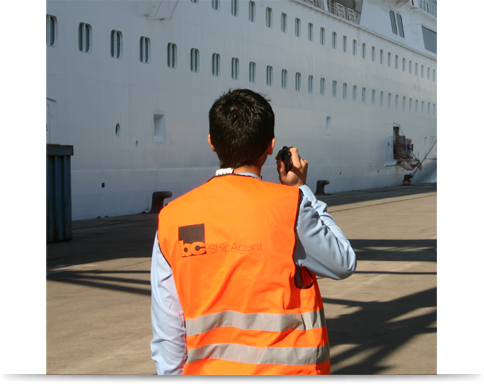 BC is a family-owned group of companies with over a 35 year of experience in the maritime and tourism sector and pioneer in providing ground services for various types of shipping in Spain. With permanent presence in the main Spanish ports, the group has been building up not only a national, but also an international reputation in the market, as a result of the impeccable work and dedication to excellent service, which is its trademark. With five quite different areas of business, but all concerning the service sector, BC holding has been active in the growth and development of the cruise industry in Spain. Looking after their customers’ interests as much, or even more than if they were their own, this empathy and proximity has allowed them to create some of the values most appreciated by their customers, in a complex and diverse market, which increasingly tends towars homogenisation. BCagency, as an organization dedicated to render services to passenger and cargo ships, ferries, yachts and military vessels, as well as touristic transport services of passengers, customs agencies, travel agencies and sales in duty free shops, has as its most important purpose to provide services that meet in highest degree the expectations and needs contractually defined with its clients, as well as the fulfilment of the objectives and interests of the Organization, among which environmental goals and objectives are defined in order to improve the BC AGENCY relationship. As a fundamental part of this achievement in the objectives, the BC AGENCY Management considers it essential and is committed to carry out the implementation of a Quality and Environmental Management System that defines and reflects the organization of all the factors that affect the quality of its services and that it serves as a tool for the optimization of the processes that are carried out internally, as well as allowing to assess the nature, magnitude and environmental impacts of its activities and services and establish actions to minimize those environmental impacts considered more significant. With the implementation of a Quality and Environment Management System, the Organization also acquires a commitment of continuous improvement and pollution prevention as well as complying with the applicable legal requirements, with the requirements that the Organization subscribes related to its environmental aspect and with the International Standards ISO 9001 and ISO 14001. The Management is committed to forward to all the parties concerned (customers, workers, suppliers, port authority and society), this Quality and Environment Policy in order to ensure that it is understood, applied and maintained up to date by all levels of the organization. As in everything we do, we know that the responsibility and ethics are two fundamental pillars; this is reflected in a commitment to our environment, which is part of the philosophy of our company. We are proud to say that our staff have carried out humanitarian work over the years for: Cursa de la Dona, Osona Foundation, Caritas and AECC. For BC the mission is to facilitate at most all the arrangements for customers, such formal, informal, operational and logistics on the basis of a thorough knowledge of them, playing everything under within environment of confidence, friendly and personalized service. BC’s philosophy is based on trust, transparency, expertise, strength and commitment to each of our operations, regardless of size in each of our professional area. The wide variety of officers and unofficers, transactions are as specific as needs may exist. Thus, to value 65 years of experience and the trust of companies, both national and international are our greatest values for our customers. Undoubtedly, the hallmark of the house is represented by the people linked to BC. A wide range of qualified professionals working within the services sector, located through Spain, Portugal and USA, composes the BC people. Professionals with proven experience, but above all with a positive and proactive attitude, who enjoy their work, knowing that once the requirements of quality are met with reliability and enough quickness, what really matters is the attitude.Our team is what distinguishes BC; in fact, we are not only professionals with experience and competence, but also with a positive attitude towards what surrounds us.